When the United States withdrew from the Paris Climate Agreement, 100 private corporations reaffirmed their commitment to fighting climate change. While governments are often the tasked with facing climate change, many major private institutions are taking steps to significantly reduce carbon emissions reaping the benefits of favorable public image and reduced operational costs from energy and other savings. While private action alone will not be sufficient to address climate change, it can buy time while government policy plans are developed and enacted and can significantly add to the collective mitigation efforts. 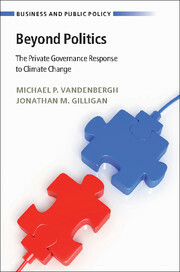 In their new book, Beyond Politics, Michael Vandenbergh and Jonathan Gilligan argue that private climate initiatives could reduce carbon emissions by up to one billion tons per year over the next ten years. Vandenbergh and Gilligan identify current initiatives and explore future pathways for private climate action, including public and private synergies for climate mitigation and approaches for evaluating the effectiveness of private action. Co-authors Michael Vandenbergh and Jonathan Gilligan, as well as our leading co-panelists, discussed the role of private institutions in climate change mitigation. They discussed the incentives for private actors pursuing carbon reduction initiatives, key factors in successful case studies, and methods for developing and evaluating successful private climate initiatives. Join the Environmental Law Institute for the first seminar in the new series . This series will focus on legal issues surrounding climate mitigation and adaptation, and feature experts representing a variety of sectors, including academia, government, industry, and NGOs. This panel dove into the ruling and its potential implications for future litigation in a world of changing climate, extreme weather, and uncertain liability. ELI members have access to a recording of this session. If you are not an ELI member but would like to have access to archived sessions like this one, go HERE to see the many benefits of membership and how to join. Hunton Andrews Kurth and the Environmental Law Institute are holding a complimentary summer speaker series featuring key representatives from environmental regulatory agencies. The series of informal seminars will provide attendees with the opportunity to directly interact with environmental regulators and professionals in the field on the latest issues and challenges in environmental law in California and throughout the western United States. The mission of the San Francisco Bay Regional Water Quality Control Board is to preserve, enhance, and restore the quality of California’s water resources and drinking water for the protection of the environment, public health, and all beneficial uses. The SF Bay Regional Water Quality Control Board is one of nine Regional Water Quality Control Boards in California, all of which operate under the auspices of the State Water Resources Control Board (State Water Board). The Water Boards are tasked with implementing the Porter-Cologne Water Quality Control Act and the federal Clean Water Act and have regulatory responsibility for the water quality of California’s nearly 1.6 million acres of lakes, 1.3 million acres of bays and estuaries, 211,000 miles of rivers and streams, and about 1,100 miles of California coastline. Speakers discussed the latest topics of significant interest to the public and the priorities being pursued by the Regional Water Quality Control Board. After decades of dominance by three investor owned utilities (IOUs), California is experiencing a transformation in its energy procurement landscape through the emergence of Community Choice Aggregators (CCAs). Recent studies anticipate that the growth of CCAs will pose an ongoing challenge to the IOUs, which could see a significant share of their load departing for CCAs in the future. What are the likely impacts of continued CCA growth? How will CCAs be impacted by CPUC-imposed exit fees? What are the power procurement strategies of CCAs and how will those impact development of new renewable energy projects? How can renewable energy project developers work with CCAs so that new energy projects utilizing power purchase agreements with the CCAs can be financed and sold? The contamination of drinking water by per- and polyfluoroalkyl substances (PFAS) has garnered much attention in recent years, most recently on July 26 with an incident in Parchment, Michigan where officials told residents to stop drinking the tap water after levels of PFAS reached 26 times higher than a federal health advisory. But what exactly are PFAS and what are the impacts of and rules regarding their use at industrial and military sites? PFAS include perfluorooctane sulfonate (PFOS) and perfluorooctanoic acid (PFOA) and are a class of man-made chemicals that are notoriously challenging to remediate, and PFAS exposures and risks can result in regulatory concerns and active management at contaminated sites and surrounding areas. Join ELI and leading panelists for an in-depth discussion on the sources, overarching chemistry, environmental fate and transport, exposure, toxicology, and occurrence of PFAS with an emphasis on the state of knowledge regarding the characterization, risk management, and remediation of PFAS-impacted sites. Expertly moderated by Dr. Peter Zeeb, Senior Principal, President, and CEO of Geosyntec Consultants, the panel provided leading updates on state and federal regulatory issues and explored the spectrum of legal challenges associated with the use of PFAS at industrial and military facilities. ELI members have access to a recording of this session (usually posted w/in 48 hours). If you are not an ELI member but would like to have access to archived sessions like this one, go HERE to see the many benefits of membership and how to join. An examination of EPA's many accomplishments, and occasional growing pains, experienced during the first two years implementing the 2016 "Lautenberg Amendments." A panel of comprised of key participants in the development and implementation of the 2016 amendments were engaged in a lively discussion of the daunting effort required to meet the numerous deadlines imposed by the legislation and the many policy and legal challenges facing both the Agency and the public interest and regulated communities affected by the Lautenberg amendments to the Toxic Substances Control Act. Key stakeholders held an unbridled conversation about their expectations and frustrations, and expressed their meditations on the future. The Washington Regional Food Funders (WRFF) is a network of philanthropists, foundations, and companies working together to foster a sustainable, equitable, and thriving food system in the Chesapeake region. WRFF is proud to host the Chesapeake Food Summit and continue the regional conversation around strengthening the Chesapeake Foodshed. The event is being co-sponsored by the Environmental Law Institute. The Chesapeake Food Summit is an unique opportunity for our region’s food system leaders to come together as one community to form new relationships within the food sector, share the latest innovations, and build on the great work already happening to strengthen our region’s growing food system. Unprecedented interest, innovation, entrepreneurship, and economic activity are creating a regional food system that celebrates the diversity of our region’s history, resources, and people, making the safest, healthiest, and most sustainable food available to everyone. The champions of our food economy—our region’s nonprofit leaders, community advocates, farmers, fishers, producers, distributors, retailers, chefs, funders, investors, policymakers, health professionals, educators, media, and consumers—are responsible for the great progress that we’ve made. The Summit is a forum for leaders from across the foodshed to hear their peers’ perspectives and together take the next steps to accelerate food system growth from farm to fork. The Summit will be a collaborative environment where new relationships can be built, past successes and new innovations can be profiled, and inspiration can be found in the diversity of participants and new innovations can be profiled, and inspiration can be found in the diversity of participants who share an interest in working together to nurture a better food system for all. With a deep history as a center of food commerce in the nation’s capital, the Union Market District is renowned for launching and scaling food businesses and for creating community around diverse yet likeminded creative entrepreneurs. With Union Market at its center, it is the perfect setting to bring together thought leaders, advocates and business representatives to innovate and create new paths forward. View the complete 2-day agenda HERE. Sponsored by the D.C. Bar Environment, Energy and Natural Resources Community and co-sponsored by the Environmental Law Institute. This year marks the Year of the Anacostia River. Even as the DC region celebrates the great strides that have been made in rehabilitating this beloved river, the occasion also calls for reflection on the choices and circumstances that led to the river's toxic past, and on the trade-offs that its renewal will bring. Our panel explored the successes and challenges of the Anacostia River cleanup; the work of citizen scientists and citizen activists, alongside government agencies, in shepherding that effort; the role of lawyers and the law in the river's fall and rise; and what is being done, and what needs to be done, to ensure that the communities that lived with the river through its worst years will benefit from its brighter future.